I think that being born in Cradock House has made me grateful all my life. It makes me feel I am part of it in a way that my mother Miriam never was. The narrow stairs and the brass doorknobs know my hands and feet, the bony thorn tree and the apricot bush hold me inside them, carrying me in their sap from year to year. And I own a bit of them in return. So when Cradock House was taken away from me, I could not understand my life after that. 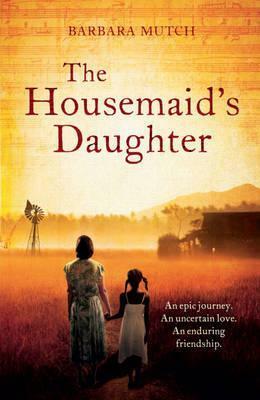 1935: Isolated and estranged on the arid plains of South Africa, Irish Cathleen Harrington finds solace in her diary and the friendship of her housemaid's daughter, Ada. Under Cathleen's teachings, Ada grows into a talented young woman, an accomplished pianist and an avid reader. But when she finds she is expecting a mixed-race child, she flees the home she loves. Forced to carve a life for herself, Ada swears she will never return. But Cathleen risks everything to search for Ada and teaches her the most important lesson yet - that beyond the cruelty of their divided country, there can still be love, hope and redemption. Around once a year, I read a book like this one and just know it will stick with me for life. Irish born Cathleen Harrington now lives in South Africa with her distracted husband and two children. Served by their faithful housemaid Miriam and her young daughter Ada, Cathleen is learning to adjust to her new life. The novel is written from Ada’s point of view but through her interactions with Ada and surprisingly few snippets of Mrs Harrington’s diary, the reader grasps the character of this truly selfless lady that will be so influential on Ada’s life. Following Ada’s journey from childhood to adult and mother we experience her first tragic love for Cathleen’s son Phil, her pleasure in playing the piano, her rejection by both whites and blacks when she conceives a child which fits with neither. We experience the tumultuous emotions; fear, love, rejoicing for Ada’s exotic and wilful daughter Dawn. It’s a story of dancing and music, hope and love, revolution and courage. The cover compares the novel to The Help, but I think this just doesn’t do the book justice. Yes they both feature black housemaids serving white families, but where The Help portrays a group of maids united in vengeance against a common (white) enemy, The Housemaid’s Daughter is the story of the most forbidden of friendships, flowering despite the harshest conditions. The love and respect between Mrs Harrington and Ada conquers all barriers except death. One thing just didn’t ring true for me; Ada welcoming her ‘Master’ to her bed with seemingly open arms. As a young girl with no sexual experience, surely the first emotion would be fear, especially considering he has never shown any particular warmth towards her. The ongoing belief throughout the rest of the book that this circumstance was ‘her duty’ to him in his misery and loneliness still lacks something for me. Possibly I have misjudged the attitude of servants at this time to their white families. The interesting thing about this novel is just how visibly you can see the author growing with her main character. It’s like she’s learning to love Ada along with us. At first it’s hesitant, perhaps overly detailed too soon, but as a big fan of South Africa flaws and all, I just love the detail that went into this novel, from the delicate pink roses in the Harrington’s gardens, to the dirty angry Groot Vis river, to the sound of rain on Ada’s corrugated iron roof and the feel of it between her toes. If you’re like me and love historical novels with a personal touch, you’ll adore this captivating debut. This sounds wonderful, will need to look out for it!